It’s officially the start of summer, and with summer comes the opening of beaches pools and other aquatic spots filled with people. If you haven’t quite gotten the energy yet to get up and get in shape for the summer, fear not, there’s still time for you. If you haven’t managed to get out because you feel self-conscious or just generally hate the gym, purchasing a treadmill for your house would be a wonderful incentive for you to start your workout. This review will go over some of the best treadmills you can purchase for your home for under $500. At the top of our list is this ProForm Treadmill that will get you back into the shape you were looking for. Amazingly enough, this treadmill has been rated a total of 5 out of 5 stars on Amazon, indicating that it is sure to please and encourage you to get out there and get in shape. Marketed as a lightweight and small fitness machine, the walking area only measures at about 16 inches by 50 inches and is wonderful for those who don’t have much space in their house. Weighing a total of 165 pounds, it would be easy enough to set up with one or two people. In the interest of being space saving, this model can also be folded vertically to save on floor space. This means that it’s easy to simply fold it up and put it in a corner when you have guests or want to move it out of your way. Included in the workout plan the treadmill offers there are 16 different workout modes and an automated 0% -10% incline running on 2.0 horsepower. All of the programs on the treadmill are created by a certified trainer. What’s better than working out in the comfort of your home and also having your own personal trainer for free? These workouts will target calorie burn, speed and endurance goals. If you plan on training for any sort of run or race, the endurance modes would be the best for you. Since they are designed by a personal trainer, you can rest assured that you are training the correct way and you won’t hurt yourself while doing so. The presets for speed, incline and distance will let you set your pace and goals to you don’t under or over work yourself. If you are interested in the speed portion of the presets, you can boost your speed by up to 10 miles per hour and tilt the track to a 10% incline. Having a treadmills that give you the option to run on an incline allows you to train yourself for any literal uphill battles in your future. Ideal for training on rough terrain and mountainous trails, this can give you an advantage over your competition. There is also an automatic incline that is included on the treadmills that in the past has been reserved for more expensive treadmills. Not only will the incline motor be extremely useful to your fitness regimen, but it can also help to keep your boredom at bay by switching up your routine a little bit when you need it. When you use the treadmill on an incline, it can also help you to burn more calories than as opposed to if you were on a flat surface. In addition to this, you will see a significant improvement in your muscle definition. As you adjust the grade on the incline, you will gradually shorten your stride, which will in turn keep a focus on the different muscle groups in your body. Cushioning on the trail will assist those who have previous stayed away from the treadmill due to foot, ankle or knee pain. Running on sidewalks can cause significant pain due to the hard surface not absorbing any of the shock when your foot lands. Treadmills in general are better at absorbing shock, but the right amount of cushioning can help to reduce premature pain. The ProShox system is an air based cushioning design reduces the stress that running can cause on your joints. While you are running it makes small alterations on the track with every step you take. Not only will you feel little to no pain when you are running, but it can also help you get toned even quicker than running on some other treadmills. Not only does this treadmill offer some awesome features for the fitness part of your workout, but it also has some amazing audio to help you get pumped up for your training. You can plug a headset right into the treadmill itself and stream your favorite songs while you work out. Studies show that listening to music while you work out is a great distraction from any pain or need you might feel to stop. It can also be a great motivator to get up, get out and keep going. If you prefer not to use headphones, this treadmill also features speakers to play your music out loud. Finally, this offers a relatively simplistic console for the selection of your workout and preferences. Most modern day treadmills have tons of fancy buttons and screens that nobody really seems to use, but this one will bring you back to the basics and give you exactly what you need to see. The low-tech design is part of why this machine is so inexpensive. The data it will show you throughout your workout includes the speed, time, distance and calories burned. There are also EKG grips that will show your heat rate if you want to hold onto the handles while you work out. This great little machine would be a good choice for professionals, as well as those who are just starting a fit lifestyle and are looking to get out into the fitness world. 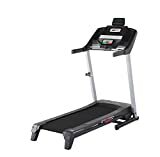 You can purchase this treadmill on Amazon for $399.99 with free shipping. Second on our list is another great machine to help you get in the shape you want to be in. This model is quite similar to the one seen previously, but has just a few more bells and whistles to go along with it. This treadmill offers all of the necessities for a good cardio workout in addition to pretty much anything an at-home fitness enthusiast could need. This smaller model is ideal for those with little space to spare. As with the previous model this will also fold up and can be put away when not in use. If you choose to use this feature, it is extremely easy to simply fold it up and can be put it away. When you want to bring it back down again, there is a soft drop mechanism that will assure a safe, hassle-free unfolding so it won’t slam down on the ground. 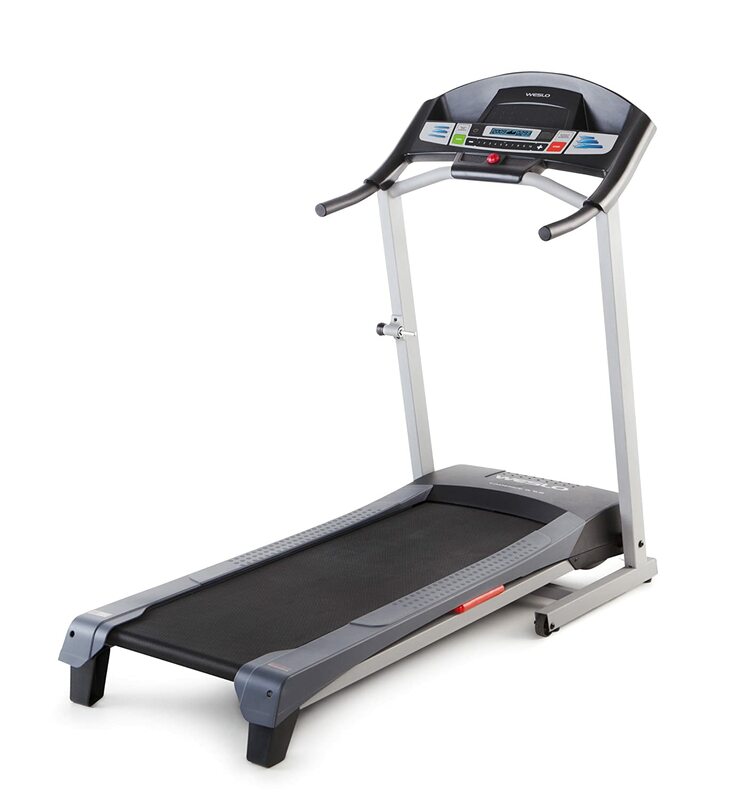 As a solid, well-built machine, this treadmill features a 2.20 horsepower motor that is efficient and quiet for its size. Overall it has a smooth feel when you run on the machine, and will offer you a great running experience. The running surface is almost exactly the same as what the previous one was, measuring at 16 x 49 inches long. You can decide what your speed is from the console with different quick adjustments, or there are also convenient controls on the hand drops that will allow you to maintain your full concentration. With controls on the hand grips, you don’t have to take your focus off your legs and can instead adjust the speed based on where your hands naturally fall. While the model prior to this one offered incline speeds differing from 0% to 10%, this one offers only three different levels. It’s still great to have the option to have an incline, but it can easily become uncomfortable if the incline levels fall between where you are comfortable running. This also has a slowest setting of .5 miles per hour all the way up to 9 miles per hour. While this is one less speed than the ProForm offered, it still gives you a relatively wide range to choose from so you can spice up your workout if need be. The quick start speed buttons will automatically jump to all of the even speeds so you don’t have to spend your time scrolling through the speeds when you just want a specific one. It has the ability to jump directly to 2, 4 and 6 miles per hour and you can still use the regular up and down arrows to find the speeds between these ones. As mentioned before, you can also use the handrail control keys to start, stop and adjust your speed. It just depends on how comfortable you are with placing your hands on the machine when you are running. The main difference between this machine and the one prior, is the large easy to read display feature on the Sunny Health model. ProForm was able to boast simplicity for those who prefer to just hop on the treadmill and work out, while this one offers a little more technology and personalization if that is something you are interested in. With 9 built in workouts, you can easily select from the screen what workout you want to complete for the day and all the while is will tell you the time, distance, speed, calories and pulse. Preset programs can also encourage you to keep coming back day after day to track your improvement over time. If you are looking to cut back on your weight, keep in mind that this treadmill has a maximum weight capacity of 220 pounds. This may eliminate quite a few potential users with the low weight limit. Covered under a 1 year frame warranty and a 90 days parts warranty, this machine is available on Amazon for $379.00. 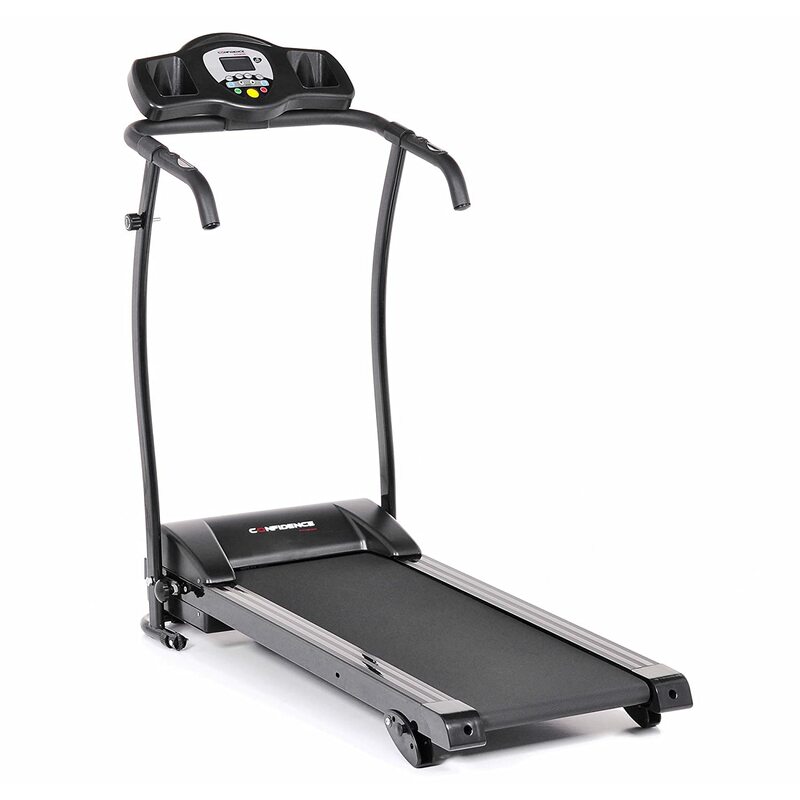 Another great contender on our list is this Weslo Cadence Treadmill. 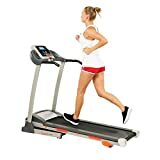 According to many of the reviews, this is a wonderful treadmill for both professional athletes and those looking to get started in the world of fitness. As a number one bestseller on Amazon how could you go wrong? While this is also a foldable treadmill that will stay out of the way of your guests and other house residents, it is slightly bigger than the previous two which is something to keep in mind. 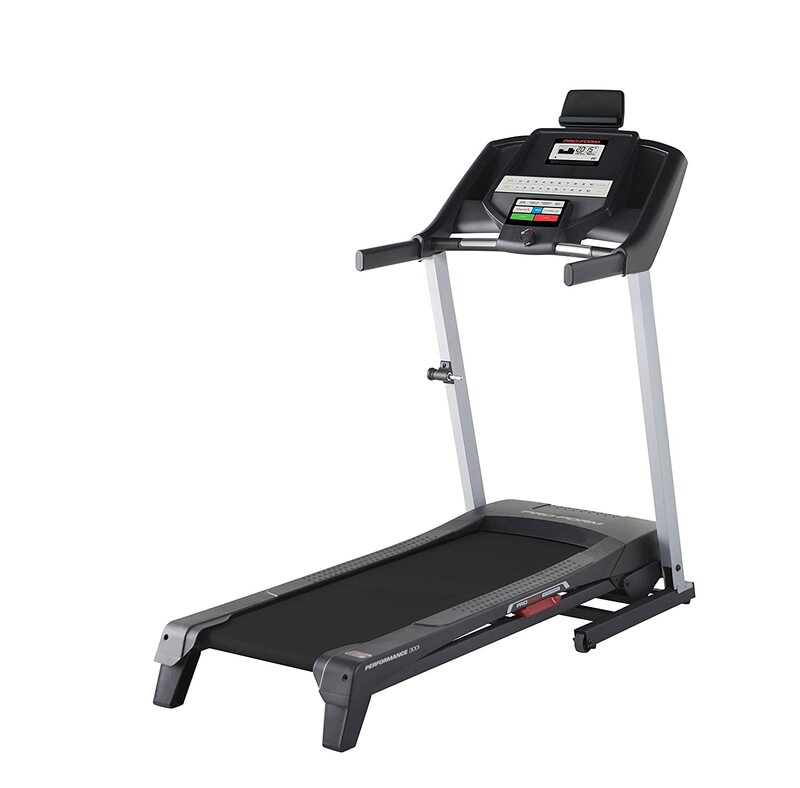 Measuring at 64 x 29 x 55 inches on this model, it is still quite compact compared to the traditional treadmill. This adds up to about 16 x 50 inches of running space in total. Running on a 2.25 horsepower motor you’ll be able to get in a good workout with this machine while not breaking the budget. Featuring a two position incline, you can make the decision on whether or not you want to train for an uphill battle. This is significantly different than the other two machines as it only has two different settings. Other models include 3 independent settings or the ability to set it anywhere between 0% and 10%. If incline is a very important aspect of this machine to you that is something to keep in mind before you make the purchase. If you check out the pre-purchase considerations below, they can help you make the final decision. Don’t want to spring for a personal trainer? No problem! This machine also offers 6 different workouts that are preloaded onto the model for you to choose. They are all designed by a certified personal trainer so you can trust that you are in good hands. This will also help you maximize your time for a great work out. No more wasting your time reading up on workouts on the internet that don’t have any sort of fitness credibility. This is so much simpler. It also features comfort cell cushioning so you can stay comfortable with every stride you make when you are working out. It is extremely important to reduce stress on your joints and increase your workout comfort to encourage yourself to keep coming back to the treadmill. If you are in pain and your knees are aching after every single workout, you’re a lot less likely to enjoy it and come back a second time. However, if you genuinely enjoyed it you will come back to keep getting in shape. As a budget pick, this machine will be able to provide you with a great workout without breaking your bank. This machine in particular is ranked as one of the very bestselling designs in its category and is also considered an entry level machine for beginners. Overall these are ranked among the top 20 bestselling treadmills for over a year, gaining happy new customers relatively consistently. The Confidence treadmill measures at 43.5 inches in length and 15.75 inches in width creating a relatively small space for you to run on. However as this is a space efficient design, the sacrifice had to be made somewhere in order for it to qualify as space efficient. The smaller size shouldn’t affect the quality of your workout, however if you are above 6 feet tall, this can affect how long your strides are on the machine. It weighs a total of only 68 pounds, a significantly smaller weight than any of the other models on this list. On average they have weighed about 120 pounds so far. This is wonderful news for those who plan on setting this up themselves or live in apartments where they would need to get the machine up a ton of floor levels. Because it is so light, it also means that is has a smaller weight limit it can hold at a maximum of up to 265 pounds. This is not unusual for a treadmill, however, if you are concerned about the weight limit, there are options on this list that can hold more. The display console with an LCD screen features all of the button functions. It of course has a safety key and storage area for your water bottles and phone. There is no shelf on the treadmill though if you planned on watching a show on your phone or reading over a paper while you were on it. It is a nice feature to have, but is not overall an essential part of your workout. The Confidence machine does not offer a huge range of speeds that the other models had, and you are mostly limited by three speed settings to choose from: 1.86 miles per hour, 3.1 miles per hour and 4.3 miles per hour. With 12 present training programs on the treadmill, you won’t get bored with the exact same routine day after day. It also caters to different fitness levels to use a different combination of speeds across 20 segments to provide a varied cardiovascular workout. If you want to increase the intensity of the workout while you are on the machine, just adjust the incline setting before you step on the running belt and begin the program. Overall it is a great machine for a beginner with a tight space requirement. If you are interested in purchasing this for your home, it is available on Amazon for $259.00. Do you prefer simplicity or modern technology? Everyone has their preferences when it comes to technology, as some people see it as a wonderful addition to our life and other see it as simply a nuisance. Depending on how you view it can make a difference in which model you choose to purchase. Some of the above machines have a very simple process that will get you working out and sacrifice some of the frills for the inexpensive design. Others have a variety of features to choose from to enhance your workout. What is the weight limit of the machine? Getting into shape is definitely a process that requires hard work and dedication. Getting on the treadmill just once isn’t going to make much of a difference in the long run, as it will require extended training to get back in shape. The treadmills listed above have many different height and weight limits they can handle at maximum. Keep in mind who plans to use this machine, as a weight above the maximum can affect the quality of your workout, and the resilience of the machine. How important is incline to you? All of the machines on this review have an incline to add to your workout, however, keep in mind that they all have very different versions of the incline and how far they will actually go. If you are purchasing a treadmill to prepare yourself for some major uphill climbing, you want to look for a treadmill that has a strong variety of inclinations so you can better prepare yourself for that. It is also a good idea to gradually ease yourself into the height differences. However, if on the other hand you are looking to purchase a treadmill that will give you a little bit of incline for calf definition, it isn’t necessary to have as many different options. Whether you are a professional athlete looking to upgrade your current training situation, or someone who desperately wants to get back in shape, your overall goal and use for this machine should be the deciding factor in choosing what you want to purchase. For the most part, all of these machines are ideal for new runners who have little to no experience with working out. Most of them even have workouts that are preloaded onto the machine for extra help when you need it. However if you are looking to train for something specific you want to do, keep this in mind as each of these machines have different features that will contribute many different things to your workouts. There is a great treadmill in this review for you no matter who you are or what you plan on doing with the machine. Simply look through the pre-purchase considerations and the reviews to make the decision about what you are mainly concerned about for your fitness career.